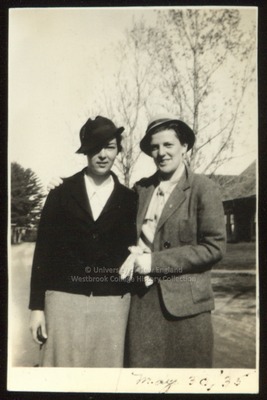 Two Westbrook Junior College students, Frances Savage and Shirley Cole, stand side-by-side in this1935 black & white candid snapshot labeled "May 30, '35" on the front. On the back is written in blue ink: "Savage & Cole--Were we ever in style!" Savage and Cole wear skirts, suit jackets, white blouses and hats. They wear their hats at a jaunty angle to the left. Cole holds white gloves in her left hand and has her right arm and hand on Savage's right shoulder. Sure and confidant, the two college girls look into the camera and smile.